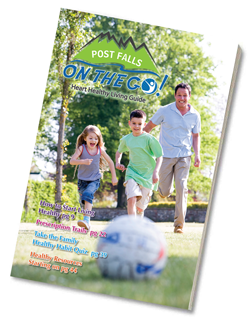 Discover Post Falls | Post Falls On The Go! Our city, known as Idaho’s River City, is within one hour of almost any activity imaginable. In the spring and summer, lakes and rivers provide fishing, boating, water-skiing, para-sailing, swimming, kayaking, canoeing, stand up paddle boarding and scuba diving. There are many mountains and trails that offer the outdoor enthusiast hiking, biking, backpacking, camping, rock climbing, bird watching, skateboarding, and horseback riding. During the winter there is snowmobiling, downhill skiing and snowboarding, tubing, ice fishing, cross-country skiing and snowshoeing. Surrounded by mountains in the heart of North Idaho’s recreational mecca is where you’ll find Post Falls. Right on I-90, and along the Spokane River, Post Falls is the perfect getaway and gateway to your North Idaho adventure. Post Falls is 2,150 feet above sea level and is located five miles from the Washington State border on I-90. It is 64 miles from the Montana border and 120 miles south of the Canadian border. Post Falls has four distinct seasons, with temperatures ranging from the 90’s in mid-summer to the low teens during the winter. The annual amount of sunshine averages from about 30% in the winter to approximately 80% in July and August when crystal clear days may linger well into fall for perfect golf and boating weather. Post Falls has doubled its population over the past 15 years!